Last week we sat down with Roxanne Feunette, who teaches French language classes both during the school year and throughout our summer school programme. Here is her interview to give you a more in-depth look at what to expect at Swiss summer school. How are students placed into summer language classes? When the students arrive, they take a placement test that determines which class level we will put them in. Then, the usual classes are in two parts every morning. The first part is grammar, reading, writing…. and in the second part we do speaking exercises where we allow them to express themselves as much as possible. We also introduce them more to French and Swiss culture in this second half. Can a student make significant progress in French in two weeks? Yes, I think students can make progress in two weeks because everyday they are immersed in the French context and everyday they will learn something about the vocabulary or grammar. But it is true that if they want to make a lot of progress they should maybe stay at least three or four weeks. The more they are immersed in the French surroundings the more they will learn. What is the balance between beginners and advanced French students? It depends on the year. Two years ago we had quite a lot of intermediate students. Last year we had a lot of beginners, some intermediate and a very, very good group of advanced students. It really depends on the year, it changes with the students that come each year. What kinds of things do you do with the advanced students that you can’t do with beginners? For example last year, we had a group of really good French speakers. I asked them what they needed - because most of them were in high school and they were passing exams in school the next year. So we worked on how to write a good essay in French and how to analyze texts. We did some grammar too, but mostly a lot of speaking, theory, and writing. Beyond the French teaching in the classroom, can you speak about the excursions that you take with the students? Every Wednesday we take excursions that the students really enjoy and they participate very well in. 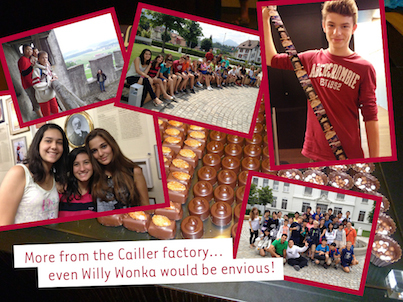 My favorite one is probably the trip we take to Cailler, the chocolate factory. This is always a popular place to go. I also quite like going to Chillon Castle on the Lake of Geneva. We do not have that many castles in Switzerland, and the fact that it is by the lake makes it really special. It is so beautiful there! This will be your fifth or sixth year of the summer course. What is it about the summer school that makes you want to do it again every year? I really like the summer course because it is totally different from the school year. There is another atmosphere. The students who come are younger, but they are also very motivated. They come to class ready to work. We also get to do all kinds of activities, not just the regular classroom teaching. Every evening we are busy, playing sports, going ice skating, bowling etc. On the weekends we also have all kinds of fun things for the students to do. I also like participating in the boarding aspects of summer school, not just the teaching. I have done boarding for a number of years as well. It is another kind of relationships that you create with the kids that makes the whole experience very fulfilling. To find out more about our summer programme, download this free ebook!